Volvo is busy preparing its entry to the midsize sedan market in the shape of the upcoming 2010 S60, which will feature radical new styling picked up by the automaker’s concept of the same name that was revealed at this year’s Detroit Auto Show. Earlier this month, production of the first-generation S60 finally came to an end, marking the end of an eight year product cycle that saw more than 580,000 cars roll off the line at the car’s Ghent factory in Belgium. 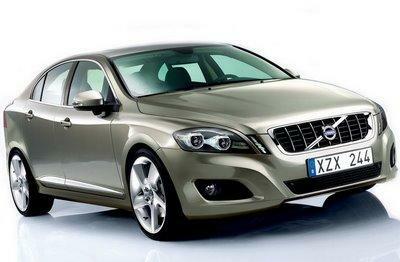 The new 2010 S60 is expected to go on sale early next year. This computer generated rendering provides a clue as to what the new car may look like, revealing that it will likely share most of the lines of the 2009 Volvo S60 concept car. At first glance, the rendered sedan features definite coupe-like proportions, accompanied by strong shoulders, which together give it a look that is very similar to the design of the recent Jaguar C-XF concept vehicle. There are, however, plenty of unique elements such as the traditional Volvo grille and sculptured headlamps with LED bulbs. Not much is known about the car’s future powertrain but one option will be a new 1.6-liter gasoline unit with turbocharging and direct-injection technologies. Previewed in concept form, the tiny mill develops a peak output of 180hp and a fuel economy rating of 47mpg. Drive will be sent to the front wheels via Volvo's PowerShift six-speed dual-clutch transmission.